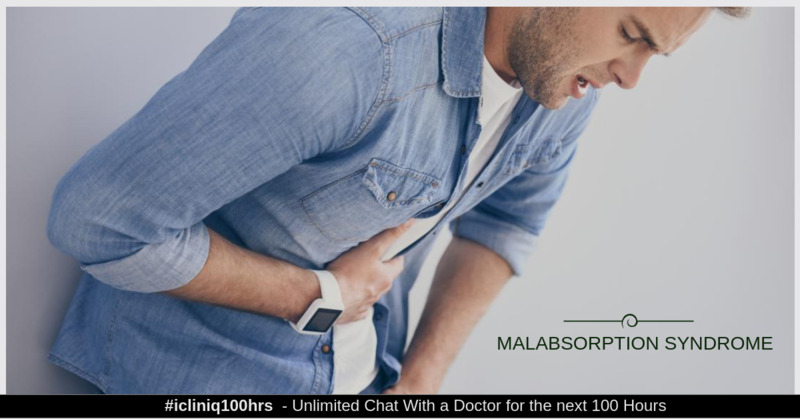 Malabsorption syndrome is a group of condition where the small intestine is unable to absorb enough nutrients into the bloodstream from the food that you eat. The nutrients that the small intestine has problem absorbing are macronutrients like proteins, carbohydrates, and fats, or micronutrients like vitamins and minerals or both. Malabsorption can be total, where absorption of all nutrients is impaired, or partial, where only specific nutrients are not absorbed. It causes excessive defecation, nutritional deficiency, and gastrointestinal symptoms. Digestion involves mechanical process and enzymatic hydrolysis to break down the food. The mechanical process includes chewing, churning and to and fro mixing of the food in the stomach and small intestine. Enzymatic hydrolysis is achieved by gastric, pancreatic, and biliary secretions. The final products of digestion are then absorbed by the epithelial cells of the small intestine. Any alteration or pathological interference in the above stages causes malabsorption, as it disturbs the typical sequence of digestion, absorption, and transport of nutrients. The main cause of is some defect or damage to the mucosal lining of the small intestine. It can broadly be classified into premucosal, mucosal, and postmucosal malabsorption. Can Orlistat cause side effects on teeth? How to reduce the symptoms of IBS? Please suggest some ayurveda medicine for IBS. Premucosal: Caused due to diseases and conditions that cause impaired digestion by affecting the secretion of digestive enzymes. Digestion is impaired in conditions like pancreatitis, pancreatic cancer, and cystic fibrosis. They affect the pancreatic enzyme secretion. Cholestatic liver disease, biliary atresia, and bacterial overgrowth reduce the bile salt concentration in the intestines. Mucosal: It is due to the conditions that affect the intestinal mucosa and reduce the absorptive area. For example, celiac disease, inflammatory bowel disease, short bowel syndrome (SBS), and Whipple’s disease. Postmucosal: Impaired absorption due to conditions that result in impaired nutrients transport in the body by vascular and lymphatic obstruction. For example intestinal lymphangiectasia, macroglobulinemia, etc. Infections caused by bacteria, viruses, or parasites, inflammation, trauma, or surgery. Use of certain drugs like Tetracycline, Cholestyramine, Colchicine, etc. Once the lining gets damaged, the nutrients are not absorbed and they pass through your stool. Light colored or bulky stool (Steatorrhea). Dry hair, hair fall, and edema due to protein deficiency. Anemia due to vitamin B12, folic acid, and iron deficiency. Malnutrition, weight loss, low blood pressure, and muscle wasting. Some females might stop menstruating. Growth retardation and delayed puberty in children. People who have celiac disease, cystic fibrosis, and Crohn’s disease. People who use antibiotics and laxatives frequently. After gastric surgeries like bariatric surgery. Consuming a lot of alcohol. Stool Tests: Stool or feces samples are tested for fat. The presence of too much fat is a sign of malabsorption. Blood Tests: The levels of nutrients like vitamin B12, vitamin D, iron, calcium, albumin, protein, and phosphorus are measured in the blood. Low levels of one or many of these nutrients might indicate impaired absorption or reduced intake. Sweat Test: Sweat sample is tested in the diagnosis of cystic fibrosis. Cystic fibrosis causes a lack of enzymes to digest food. Breath Test: Breath test is used to diagnose lactose intolerance. The unabsorbed lactose gets broken down by the bacteria in the colon to form hydrogen gas. This hydrogen gas gets into the bloodstream and enters the lungs, from where it gets exhaled. The breath of the patient gets tested for this hydrogen gas. Biopsy: A small tissue sample is collected from the inside of the small intestine. This tissue is then studied for signs of infection or other problems. The biopsy is usually collected during endoscopy. CT Scan: CT scan can be used to see the structural changes of the small intestine. For example, a thickened intestinal wall can be a sign of Crohn’s disease. You will be given nutrients and fluids that your body is not able to absorb. And your doctor will treat the health condition that is causing this impaired absorption. A dietician will create a diet plan for you, which will include nutrients that can be easily absorbed by your body, and other supplements to treat nutritional deficiency. They might give you enzyme and vitamin supplements. If the cause is increased peristaltic movement of the digestive tract, then medicines are prescribed to relax it. This makes the passing food stay in the intestine longer, thus giving it more time to get absorbed into the bloodstream. Any infection of the digestive tract can be treated by antibiotics. If you or your child have any of the sign or symptom of malabsorption, like diarrhea from a long time, it is best you consult your physician and get tested right away. Lack of essential nutrients will prevent healthy growth and development of your child. The earlier you recognize the signs and get treated, the less will be the permanent damage to your body. Do you have a question on Digestive Problems or Irritable Bowel Syndrome? Please suggest treatment for indigestion and intestinal worms. I feel current sensation in tongue while sleeping. What is the reason?